Heraldic explanations of the composite parts of the Cadillac shield are given in a small booklet that was first published by Cadillac, I believe, in 1918, then again in 1919, 1922, 1943 and 1960 (I have three of these booklets in my collection; there may have been more than five). The Cadillac crest was described also in an advertising flyer published by the Cadillac Automobile Company in 1962. However, as stated above, Tony Laumet, aka "Antoine De la Mothe Cadillac", was no French nobleman, nor did he marry into a noble family; this is historical fact. The Cadillac coat of arms is a "fake"; it was designed by the man himself; that too is historical fact. 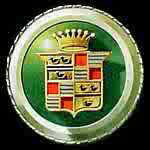 Notwithstanding the above, the Cadillac crest was well devised and stands up to heraldic scrutiny and interpretation. In the 1919 edition of the booklets mentioned above, it was remarked that "the family records of le Sieur Antoine de la Mothe Cadillac are burned" and that "just when or where he was born we shall never know". However, in the 1943 and 1960 editions, Cadillac asserted "it is fairly certain that he [Cadillac] was born on March 5, 1658, in a little town in Gascony". So, it appears that some additional information came to light between 1919 and 1943! It was asserted also, in error, that "the armorial bearings [crest] of the Cadillac family" were "older by four centuries than the coming of Columbus". As will be seen, however, the truth is quite different. In all three booklets Cadillac asserted also that "in all France there are few families more ancient than the Cadillacs", a bold statement considering the historical facts. The late Harry Pulfer, who researched the Cadillac coat of arms in America, in the early seventies, was not so emphatic. He said that its origins were "less known" although he did assert, again in error, that the "armorial bearings" of the Cadillac family "had been set down in French heraldry". In reality, however, thorough research conducted in France by historians such as Jean Boutonnet of Castelsarrasin has not turned up any such Cadillac family crest. There never was a Cadillac family in France until Antoine Laumet himself decided to "invent" it around the turn of the 17th century. The imaginary crest of that equally imaginary family is an assemblage, or "montage", of bits and pieces of heraldry that Laumet pieced together to achieve his own purpose. The only authentic parts of the Cadillac crest used on Cadillac automobiles for the better part of a century are the first and fourth quarterings. These feature two pairs of three legless hen-blackbirds; in heraldry they are known as "merlettes" [martlets, in English]; they are the heraldic adaptation of the martin. These quarterings of the Cadillac shield copy the authentic family crest of Baron Sylvester of Esparbes de Lussan, Lord of Lamothe Bardigues. The latter crest still graces the imposing wrought-iron gates of the Chateau of Bardigues, near Castelsarrasin, where international Cadillac meets have been held regularly for a number of years. 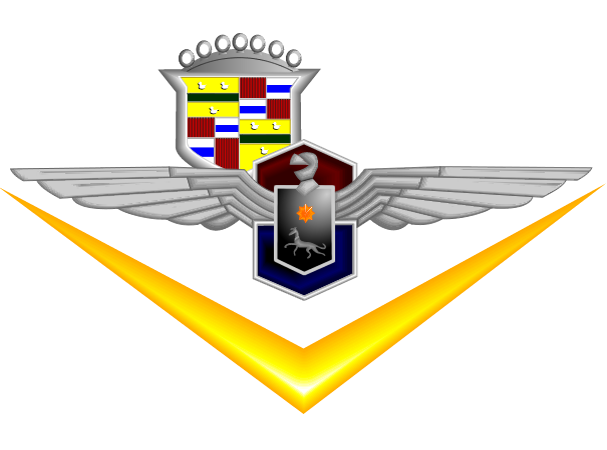 The remainder of the Cadillac coat of arms [i.e. the second and third quarters] are pure invention by Laumet-Cadillac. The Mission of the Cadillac LaSalle Club of Canada is to assemble and provide information for the preservation, maintenance and restoration of the ?Classic Cadillac and LaSalle automobiles?, enabling future generations the ability to enjoy these wonderful treasures of our history. It has been organized on the Internet to incorporate the vast geography of the Canadian landscape and the interests of all the Canadian Cadillac/LaSalle owners. It is hoped that it will help to serve as a conduit to reasonably priced classic Canadian cars and parts and to provide a free exchange of information thereby improving communication between Canadian Cadillac/LaSalle fanciers and other like minded people throughout the world. The Cadillac LaSalle Club of Canada has been incorporated as a non-profit society. Cadillac trademarks used with written permission of General Motors.